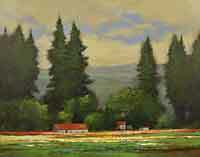 Don Bishop is rapidly emerging as one of the accomplished tonalist painters in the Pacific Northwest where he divides his time between plein air and studio work. 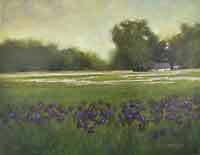 Most of his pieces are painted alla prima using different color combinations according to the season and light. His roots are firmly planted in the early Californian impressionism because of the outstanding patterns of color and atmosphere associated with this school. Don has won several awards at recent shows including a blue ribbon at the 2003 Lake Oswego Art Festival, and has patrons throughout the US include Senator John Edwards and his wife, Elizabeth, of North Carolina.